Quality Mobile Steps in two platform sizes W 610mm X 457mm 4 to 12 treads and W 760mm x 457mm 5 to 14 treads at competitive prices with free delivery on most products, Custom made products to suit your requirements Call now or order online. 4 Tread Handlock Warehouse Step with Anti-Slip Treads Tread Width 610mm Platform W610 X D457mm Weld..
4 Tread Handlock Warehouse Step with Punched Treads Welded steel tube and bar construction. Handloc..
4 Tread Handlock Warehouse Step with Rubber Treads Welded steel tube and bar construction. Handlock..
4 Tread Handlock Warehouse Step with Expamet Treads Welded steel tube and bar construction. Handloc..
5 Tread Handlock Warehouse Step with Anti-Slip Treads Welded steel tube and bar construction. Handl..
5 Tread Handlock Warehouse Step with Punched Treads Welded steel tube and bar construction. Handloc..
5 Tread Handlock Warehouse Step with Rubber Treads Welded steel tube and bar construction. Handlock..
5 Tread Handlock Warehouse Step with Expamet Treads Welded steel tube and bar construction. Handloc..
6 Tread Handlock Warehouse Step with Anti-Slip Treads Welded steel tube and bar construction. 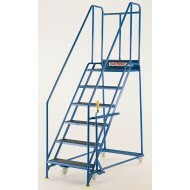 Handl..
6 Tread Handlock Warehouse Step with Punched Treads Welded steel tube and bar construction. Handloc..
6 Tread Handlock Warehouse Step with Rubber Treads Welded steel tube and bar construction. Handlock..
6 Tread Handlock Warehouse Step with Expamet Treads Welded steel tube and bar construction. Handloc..
7 Tread Handlock Warehouse Step with Anti-Slip Treads Welded steel tube and bar construction. Handl..
7 Tread Handlock Warehouse Step with Punched Treads Welded steel tube and bar construction. Handloc..
7 Tread Handlock Warehouse Step with Rubber Treads Welded steel tube and bar construction. Handlock..